There will be five good reasons for Bundesliga fans to watch the final of the FIFA World Cup this Sunday with VfB Stuttgart, Bayern Munich, Eintracht Frankfurt, Hoffenheim and Bayer Leverkusen all represented. France, champions in 1998, face first-time finalists Croatia for the ultimate prize in international football in Moscow (kick-off 5PM CEST / 4PM BST / 11AM EST) and there could be five Bundesliga stars on show. Corentin Tolisso ensures that Bayern have a World Cup finalist for the 10th edition in a row, with that proud record dating back to 1982. He is set to line up with Stuttgart's Benjamin Pavard, who has been one of the revelations of the tournament, not least thanks to his stunning goal against Argentina. Facing them could be Ante Rebic, the Eintracht Frankfurt forward whose stock has risen greatly during the summer. He also scored in the 3-0 win over Argentina which secured the Croatians' passage to the knockout stage with a game to spare. WATCH: Who is Frankfurt and Croatia forward Ante Rebic? Croatia, who are unbeaten in Russia, can also count on Hoffenheim forward Andrej Kramaric, who scored in the quarter-final win over Russia, and Leverkusen full-back Tin Jedvaj, who played the full 90 minutes of their 2-1 final group game win over Iceland. 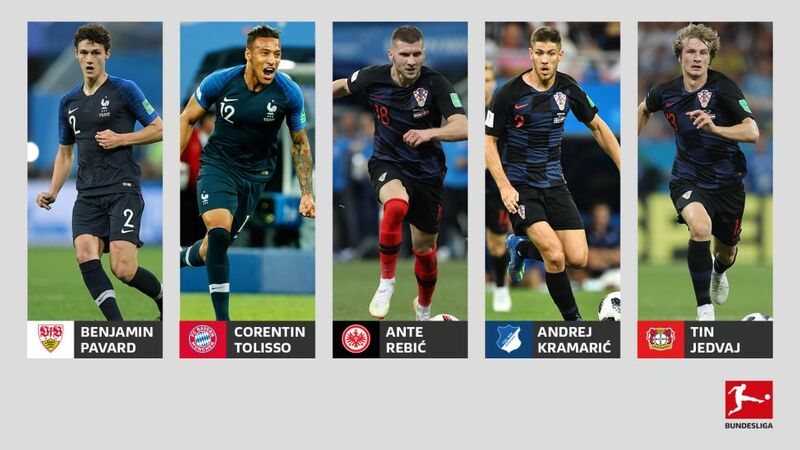 All five will return to Germany for the new season – after a deserved break – with a medal of some colour, ready to go in search of more success for their respective clubs in the upcoming Bundesliga season. Click here for all the FIFA World Cup results with our wall-chart!